Northern Sierra Archives | California Trout, Inc.
California Trout and University of California Davis, Center for Watershed Sciences, provided key results from an in-depth report today detailing the status of 32 types of salmon, steelhead, and trout that are native to California. 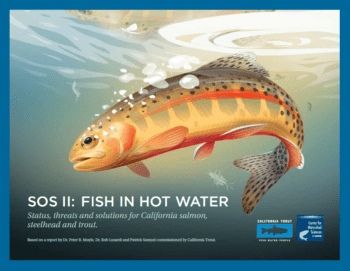 State of the Salmonids II: Fish in Hot Water offers concerning data about the declining health of these fish populations and opportunities for stabilizing and even recovering many species. SOS II: Fish in Hot Water is the second such report released by CalTrout and UC Davis, Center for Watershed Sciences. 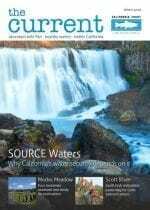 The first edition was published in 2008 and established a baseline level of health for each of 32 types of native salmon, steelhead, and trout populations in the state (including the extinct Bull trout). 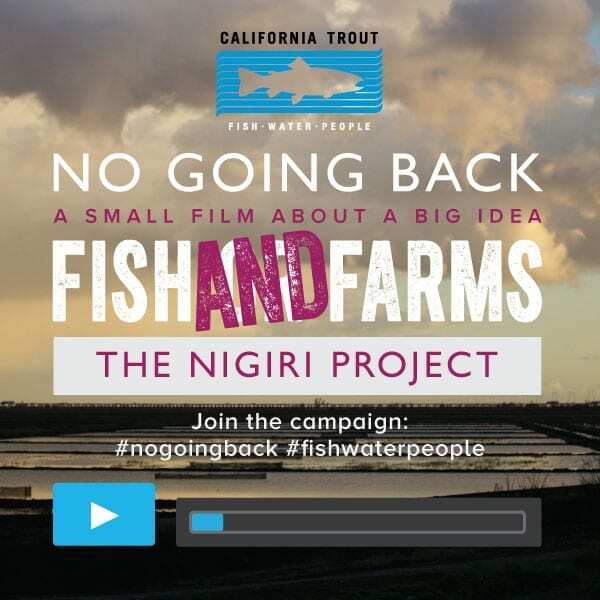 Since that time, the number of California’s native fish species likely to be extinct within the next five decades nearly tripled, from 5 to 14 species. And after five years of historic drought, 81 percent of the remaining 31 species are worse off today than they were a decade ago. If present trends continue, 74 percent of California’s native salmon, steelhead, and trout species are likely to be extinct in 100 years. 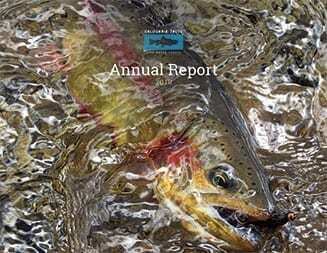 The report includes an analysis of key threats to the survival of each species, starting with the overarching threat of climate change, which is likely to reduce the availability of cold water habitat that salmon, steelhead, and trout all depend on for survival. It also highlights various other human-induced threats, such as dams, agriculture, estuary alteration, urbanization, and transportation. 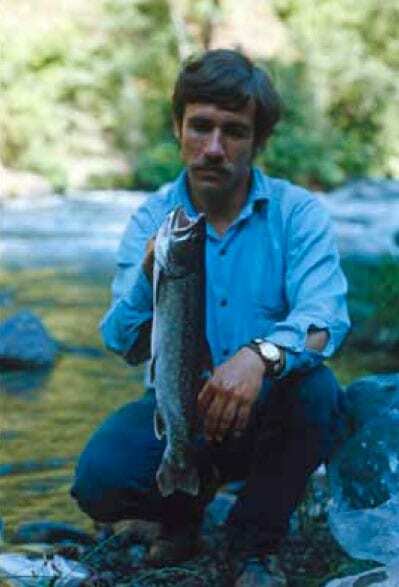 Last known angler-caught Bull trout from McCloud River, 1975. 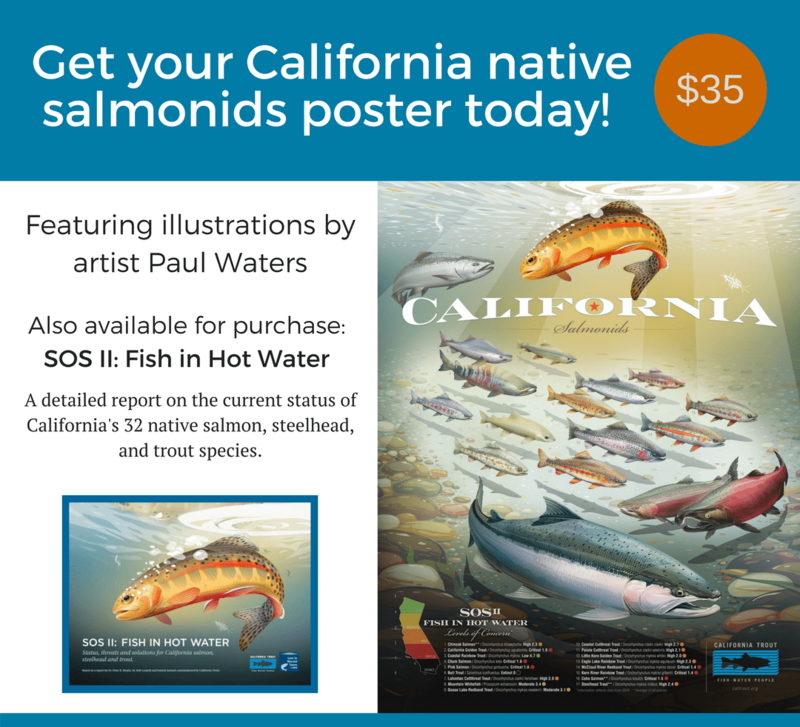 The report notes that improving salmonid status throughout California requires investing in productive habitats that promote growth, survival, and diversity. 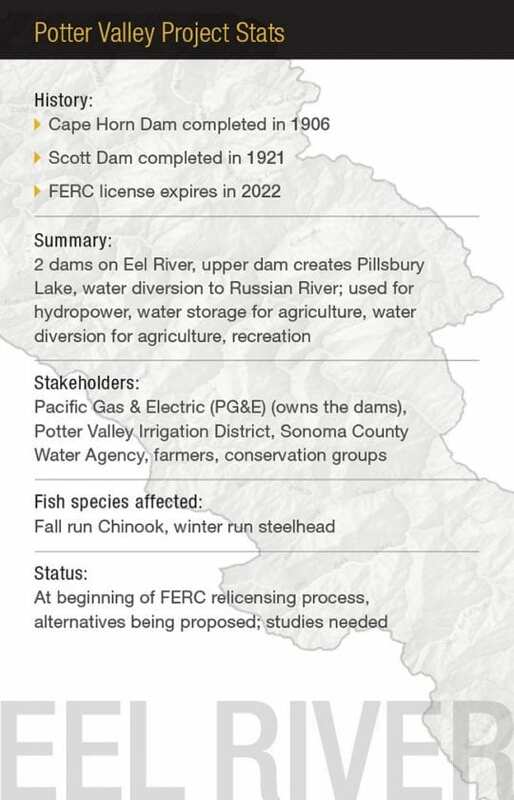 CalTrout has developed an action plan to return the state’s salmon, steelhead, and trout to resilience to help many of these species thrive. 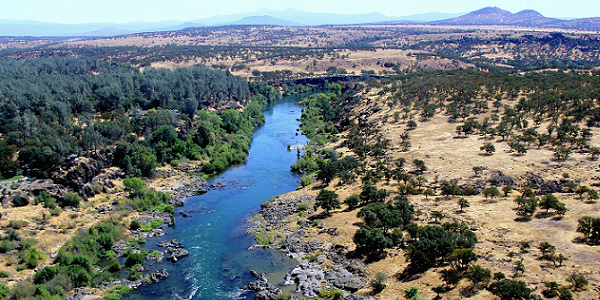 Protecting the most productive river ecosystems remaining in California, such as the Smith and Eel Rivers, must be a priority. These strongholds, among others, have the capacity to support diversity and abundance because they retain high quality habitat and are not heavily influenced by hatcheries, supporting the persistence of wild fish. 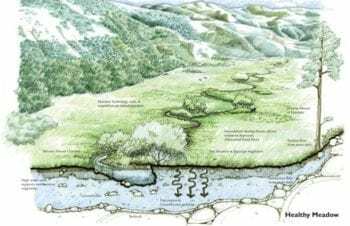 Restoring function to once productive – but now highly altered – habitats can greatly improve rearing conditions for juvenile fish, especially floodplains, coastal lagoons, estuaries, and spring-fed rivers. 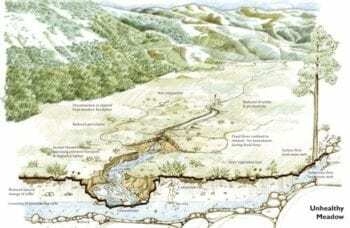 First, focus on opportunities to mimic natural processes within altered landscapes. For example, CalTrout has demonstrated that off-season farmland can mimic traditional floodplains and support rapid growth of juvenile salmon. Last, pursue strategies that increase genetic diversity of wild fish. The longer, full report is expected this summer. 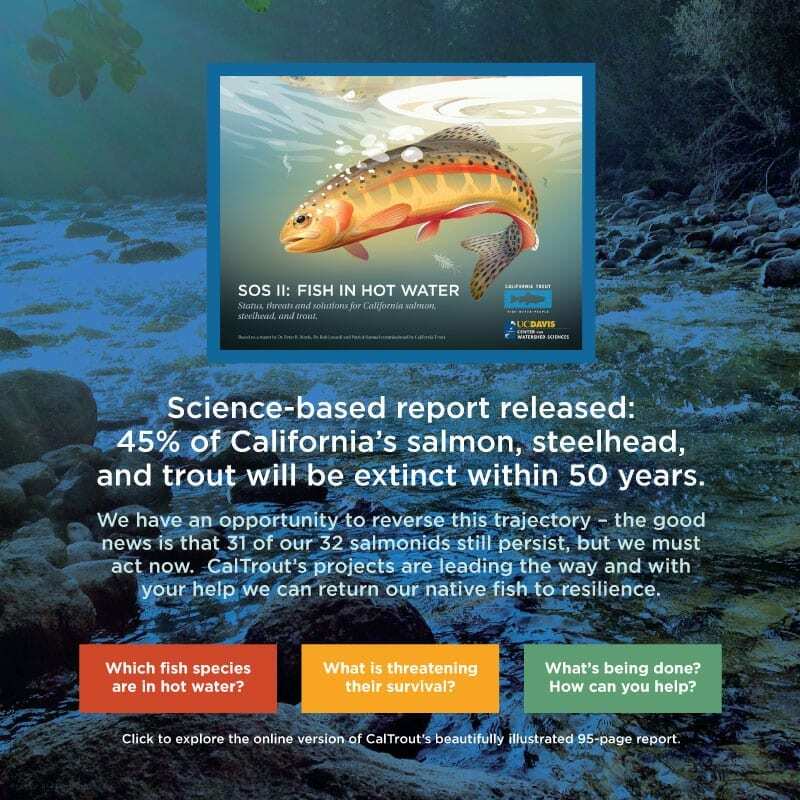 45 percent of California’s salmon, steelhead and trout are likely to be extinct in next 50 years if present trends continue. 74 percent will likely to be extinct in next 100 years if present trends continue. The number of species likely to be extinct in 50 years increased 180 percent in the last 10 years – from just 5 in 2008 to 14 today. Meadow in Ash Creek wildlife area. Photo by Todd Sloat. CalTrout was recently granted funding from the National Fish and Wildlife Foundation (NFWF) for our Sierra Nevada Meadow Restoration Program which aims to replenish the health and biodiversity of mountain meadow regions. The NFWF grant adds $62,000 to the $253,000 grant awarded by California Department of Fish and Wildlife and approximately $100,000 in-kind match from project partners for a total project budget of $397,000. 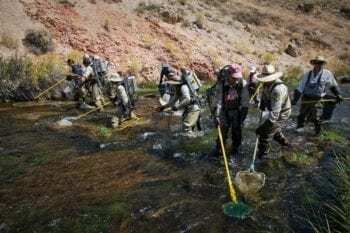 While California Trout has done extensive work on mountain meadows in the Sierra Nevada region, this project is the first time CalTrout is working in the Modoc Plateau in the Northeast corner of California. CalTrout’s Mount Shasta-Klamath office will be leading the Modoc Meadows Assessment and Restoration Design Project, bringing together a diverse group of partners to assess 30-50 meadows in the Upper Pit watershed, prioritize the meadows according to restoration need, and prepare for restoration activities on three priority meadows. 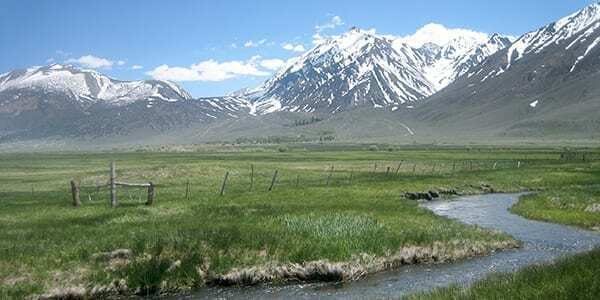 Mountain meadows are in a state of degradation in the Upper Pit River Watershed as a result of land management practices including channelization, grazing and surface and groundwater diversions for agriculture. 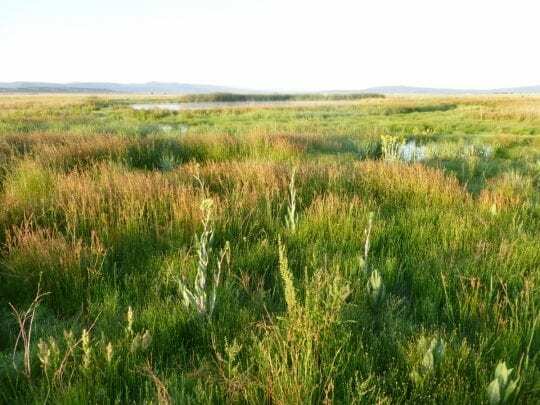 While significant meadow restoration work has been carried out on private lands, work on Federal lands (which comprise 60% of the watershed) has lagged due to lack of agency capacity. The project aims to improve hydrologic and habitat functions of meadows in the Upper Pit River watershed and further landscape-scale meadow restoration on the Modoc Plateau by working on both private and federally owned lands. 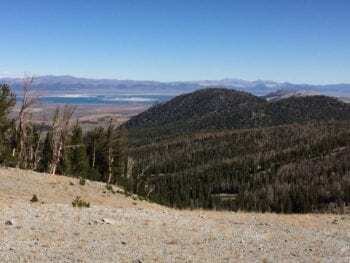 Thanks to a generous National Fish and Wildlife grant, CalTrout will be restoring 110 acres of land and removing approximately 145 decaying trees at June Mountain, working in partnership with Inyo National Forest and Mammoth Mountain Ski Area. 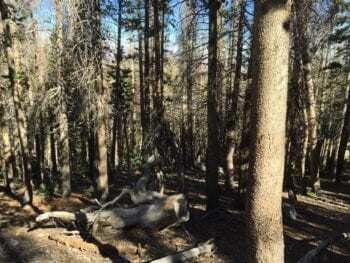 Over 70 years of fire exclusion, combined with periods of extended drought, have resulted in unnaturally dense, stressed forested stands that are currently experiencing high levels of bark beetle activity. This has resulted in an excessive amount of dead and dying whitebark pine trees. 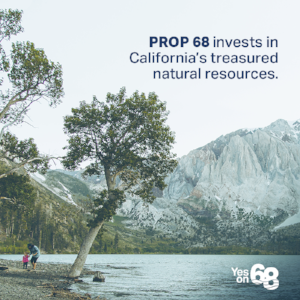 Removing them will improve forest health, decrease the risk of high intensity wildland fires, and protect aquatic resources. These lands are critically important to watershed health and forest resilience at the June Mountain Ski Area. An untamed wildland fire in this area would have catastrophic effects to June Lake and downstream Grant Lake and Rush Creek watersheds; these waterways are historic spawning grounds for wild brown trout. Dr. Mark Drew, CalTrout’s Eastern Sierra Manager, discussed how the non-infested trees will fare with the removal of damaged trees: “These trees are stressed due to drought. The best thing we can do is try to improve the health of the living trees and to remove dead ones to eliminate dead wood for the beetles.” Dead tree removal will begin in July 2017. CalTrout will be working with the US Fish and Wildlife Service to monitor the plants before and after tree removal. In addition, we’ll be developing and implementing an education and outreach program centered on forest health and expected outcomes from this restoration project. The June Mountain Ski Area Whitebark Pine Restoration Project was recently covered in the Sheet, “Save the Trees!”. 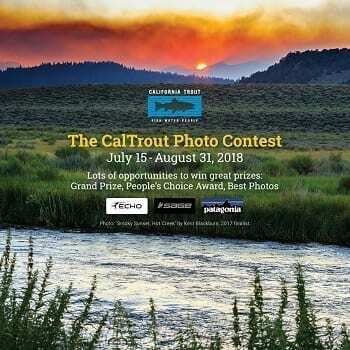 Based on visual observations and growing concern about the condition of Hot Creek, CalTrout has been working with local fly fishing guide, Kevin Peterson, and the Department of Fish & Wildlife (DFW) to assess the condition of this iconic fishery. CalTrout, working with DFW and Eastern Sierra Fishing Guides Association, conducted electro-shocking yesterday to get a sense of the numbers and species distribution in Hot Creek. 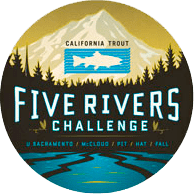 Along with the preliminary fish survey work, CalTrout is monitoring water temperatures and will be partnering with DFW to study the insect populations to better understand the condition of the food-web and if or how it be impacting the fishery. 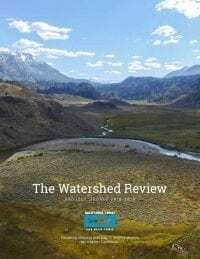 In October, CalTrout will again partner with DFW and the Eastern Sierra Fishing Guides Association to implement a comprehensive fish population study of Hot Creek. The big cause of lower fish numbers relative to years past is very likely a result of four years of serious drought and the lack of flushing flows needed to “cleanse” the streambed of sediments. 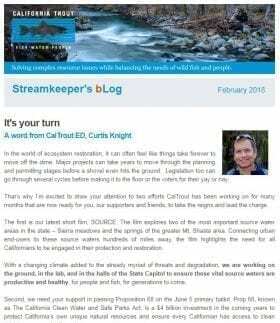 The on-going effort is a good example of CalTrout’s approach to restoration — engaging in regional fisheries issues in a collaborative manner while using science as a basis for decision making. In the Capital Public Radio segment, Restoring California Meadows Could Help Combat Climate Change And Increase Water Supply, Bridget Fithian with Sierra Foothill Conservancy gives a good explanation of the importance of the meadow restoration work being conducted throughout the Sierra by the Conservancy, CalTrout and others who are part of the Sierra Meadow Restoration and Research Partnership. A deep stream moves water through the landscape too quickly. This meadow is supposed to capture water from melting snow and slowly release it downstream into the Merced River. Click here to listen to the interview or read the full article. Recently I had the opportunity to spend a little time in the Kern River drainage and Golden Trout Wilderness. In addition to documenting some meadow restoration projects Cal Trout is involved with, I spent a few days trying to document two of California’s unique native trout species that are endemic to this area. First on the list was the Little Kern Golden Trout. These fish are native to the North Fork of the Kern River also known as the Little Kern. They look like a cross between classic Volcano Creek Goldens and Kern River Rainbows. Due to cross breeding with rainbows in the lower reaches and main stem, the fish with the most pure genetics are tucked away high in the remote tributaries. Revolution Slider Error: Slider with alias GTW not found. With limited time, I decided to try a hike into Clicks Creek on the western edge of the Golden Trout Wilderness. There were some fires burning in the area so the air was very smokey. I first encountered a few fish in a series of 5 very small pools on the south fork of Clicks Creek. The pools were completely disconnected from each other and there was no flow above or below for miles. There were 2 to 3 fish in each pool and, though it looked pretty dismal, the temperatures were low enough that they seemed like they would survive until winter. Each pool had a large rock or some kind of woody debris, like a fallen tree, that provided nooks for the trout to tuck up and avoid predators. All these pools, however, were subjected directly to cattle, which were grazing in the area. I didn’t encounter flowing water for a few more miles down the canyon. The trail descended quickly into the steep canyon and I didn’t come to the main creek until around mile 4. There I found some flowing water and a lot of nice little granite plunge pools full of happy Little Kern Golden Trout. I spent most of the day just filming the fish both from above and below the water’s surface. They were pretty skittish for how far in they were. There were few signs of people and angling. I managed to get some decent photos and videos of a few willing specimens. After filming for several hours I took out the rod and caught one fish to get a close up photo. It was a long hike out and I reached the car after dark but the mission was a success.